Galvanic corrosion is an electrochemical process in which one metal corrodes preferentially when in electrical contact with a different type of metal and both metals are immersed in an electrolyte. Conversely, a galvanic reaction is exploited in primary batteries to generate a voltage. A common example is the carbon-zinc cell where the zinc corrodes preferentially to produce a current. The lemon battery is another simple example of how dissimilar metals react to produce an electric current. When two or more different sorts of metal come into contact in the presence of an electrolyte a galvanic couple is set up as different metals have different electrode potentials. The electrolyte provides a means for ion migration whereby metallic ions can move from the anode to the cathode. This leads to the anodic metal corroding more quickly than it otherwise would; the corrosion of the cathodic metal is retarded even to the point of stopping. The presence of electrolyte and a conducting path between the metals may cause corrosion where otherwise neither metal alone would have corroded. Even a single type of metal may corrode galvanically if the electrolyte varies in composition, forming a concentration cell. A common example of galvanic corrosion is the rusting of corrugated iron sheet, which becomes widespread when the protective zinc coating is broken and the underlying steel is attacked. The zinc is attacked preferentially because it is less noble, but when consumed, rusting will occur in earnest. With a tin can, the opposite is true because the tin is more noble than the underlying steel, so when the coating is broken, the steel is attacked preferentially. 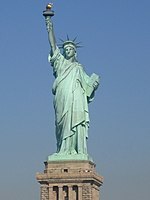 A rather more spectacular example occurred in the Statue of Liberty when regular maintenance in the 1980s showed that galvanic corrosion had taken place between the outer copper skin and the wrought iron support structure. Although the problem had been anticipated when the structure was built by Gustave Eiffel to Frédéric Bartholdi's design in the 1880s, the insulation of shellac between the two metals failed over a period of time and resulted in rusting of the iron supports. The renovation replaced the original insulation with PTFE. The structure was far from unsafe owing to the large number of unaffected connections, but it was regarded as a precautionary measure for what is considered a national US symbol. An earlier example occurred in the Royal Navy frigate HMS Alarm. The wooden hull of the vessel had been sheathed in copper to prevent attack by barnacles. It was soon discovered that the sheathing had become detached from the hull in many places because the iron nails which had been used to fasten the copper to the timbers had been ‘much rotted’. Closer inspection revealed that some nails, which were less corroded, were insulated from the copper by brown paper which was trapped under the nail head. The copper had been delivered to the dockyard wrapped in the paper which was not removed before the sheets were nailed to the hull. The obvious conclusion therefore, and the one which was contained in a report to the Admiralty of 1763, was that iron should not be allowed direct contact with copper in a sea water environment if severe corrosion of the iron was to be avoided. Later ships were designed with this in mind. Not only was sea water a very good electrolyte owing to its high salt concentration, but attack of the nails was encouraged by their very small exposed area compared with that of the copper-sheathed hull. Metals (including alloys) can be arranged in a galvanic series representing the potential they develop in a given electrolyte against a standard reference electrode. The relative position of two metals on such a series gives a good indication of which metal is more likely to corrode more quickly. However, other factors such as water aeration and flow rate can influence the process markedly. Galvanic corrosion is of major interest to the marine industry. Galvanic series tables for seawater are commonplace due to the extensive use of metal in shipbuilding. It is possible that corrosion of silver brazing in a salt water pipe might have caused a failure that lead to the USS Thresher sinking with all men lost. There are several ways of reducing and preventing this form of corrosion. One way is to electrically insulate the two metals from each other. Unless they are in electrical contact, there can be no galvanic couple set up. This can be done using plastic or another insulator to separate steel water pipes from copper-based fittings or by using a coat of grease to separate aluminium and steel parts. Use of absorbent washers that may retain fluid is often counter-productive. Piping can be isolated with a spool of pipe made of plastic materials or made of metal material internally coated or lined. It is important that the spool has a minimum length of approx 500 mm to be effective. Another way is to keep the metals dry and/or shielded from ionic compounds (salts, acids, bases), for example by painting or encasing the protected metal in plastic or epoxy, and allowing them to dry. Coating the two materials or if it is not possible to coat both, the coating shall be applied to the more noble, the material with higher potential. This is necessary because if the coating is applied only on the more active material, in case of damage of the coating there will be a large cathode area and a very small anode area, and for the area effect the corrosion rate will be very high. It is also possible to choose metals that have similar potentials. The more closely matched the individual potentials, the lesser the potential difference and hence the lesser the galvanic current. Using the same metal for all construction is the most precise way of matching potentials. Electroplating or other plating can also help. This tends to use more noble metals that resist corrosion better. Chrome, nickel, silver and gold can all be used. Cathodic protection uses one or more sacrificial anodes made of a metal which is more active than the protected metal. Metals commonly used for sacrificial anodes include zinc, magnesium, and aluminium. This is commonplace in water heaters. Failure to regularly replace sacrificial anodes in water heaters severely diminishes the life time of the tank. Water softeners tend to degrade these sacrificial anodes and tanks more quickly. For example, consider a system is composed of 316 SS (a 300 series stainless steel; it is a very noble alloy meaning it is quite resistant to corrosion and has a high potential) and a mild steel (a very active metal with lower potential). The mild steel will corrode in the presence of an electrolyte such as salt water. If a sacrificial anode is used (such as a zinc alloy, aluminium alloy, or magnesium), these anodes will corrode, protecting the other metals. This is a common practice in the marine industry to protect ship equipment. Boats and vessels that are in salt water use either zinc alloy or aluminium alloy. If boats are only in fresh water, a magnesium alloy is used. Magnesium has one of the highest galvanic potentials of any metal. If it is used in a salt water application on a steel or aluminium hull boat, hydrogen bubbles will form under the paint, causing blistering and peeling. Metal boats connected to a mains shore line will normally have to have the hull connected to earth for safety reasons. However the end of that earth connection is likely to be a copper rod buried within the marina, resulting in a steel-copper "battery" of about 1.1V. For such cases the use of a galvanic isolator is essential - typically 2 diodes in series, preventing any current flow while the applied voltage is less than 1.4V (i.e 0.7V per diode), but allowing a full flow in case of an earth fault. It has been noted that there will still be a very minor leak through the diodes which may result in slightly faster corrosion than normal. Using a protective coating between dissimilar metals will prevent the reaction of the two metals. Relative size of anode and cathode - This is known as the "Area Effect" – As it is the anode that corrodes more quickly, the larger the anode in relation to the cathode, the lesser the corrosion. Conversely, a small anode and a large cathode will see the anode readily damaged. Painting and plating can alter the exposed areas. Aeration of seawater – Poorly aerated water can affect stainless steels, moving them more towards the anodic end of a galvanic scale. Degree of electrical contact – The greater the electrical contact, the easier for a galvanic current to flow. Electrical resistivity of electrolyte – Higher resistivity of the electrolyte will decrease the current, slowing corrosion. Range of individual potential difference – It is possible that different metals could overlap in their range of individual potential differences. This means that either of the metals could act as the anode or cathode depending upon the other conditions that affect the individual potentials. Covering by bio-organisms – Slimes that build up on metals can affect the areas exposed as well as limiting flow rate, aeration, and altering pH. Oxides – Some metals may be covered by a thin layer of oxide that is less reactive than the bare metal. Cleaning the metal can strip this oxide and thus increase reactivity. Humidity – Can affect the electrolytic resistance and transport ions. Temperature – Temperature can affect the rate resistance of metals to other chemicals. For example, higher temperatures tend to make steels less resistant to chlorides. Type of electrolyte – Exposing one piece of metal to two different electrolytes (either different chemicals or concentrations) can cause a galvanic current to flow within the metal. A "lasagna cell" or "lasagna battery" is accidentally produced when salty food such as lasagna is stored in a steel baking pan and is covered with aluminium foil. After a few hours the foil develops small holes where it touches the lasagna, and the food surface becomes covered with small spots composed of corroded aluminium. This metal corrosion occurs because whenever two metal sheets composed of differing metals are placed into contact with an electrolyte, the two metals act as electrodes, and an electrolytic cell or battery is formed. In this case, the two terminals of the battery are connected together. Because the aluminium foil touches the steel, this battery is shorted out, a significant electric current appears, and rapid chemical reactions take place on the surfaces of the metal in contact with the electrolyte. In a steel/salt/aluminium battery, the aluminium is higher on the electrochemical series, so the solid aluminium turns into dissolved ions and the metal experiences galvanic corrosion. Often when design requires that dissimilar metals come in contact, the galvanic compatibility is managed by finishes and plating. The finishing and plating selected facilitate the dissimilar materials being in contact and protect the base materials from corrosion. For harsh environments, such as outdoors, high humidity, and salt environments fall into this category. Typically there should be not more than 0.15 V difference in the "Anodic Index". For example; gold - silver would have a difference of 0.15V being acceptable. For normal environments, such as storage in warehouses or non-temperature and humidity controlled environments. Typically there should not be more than 0.25 V difference in the "Anodic Index". For controlled environments, such that are temperature and humidity controlled, 0.50 V can be tolerated. Caution should be maintained when deciding for this application as humidity and temperature do vary from regions. Electrochemistry of corrosion From the Yeager Center at CWRU. The Straight Dope: why does ketchup dissolve aluminium?